NEWS of the miraculous way in which the Israelites had been brought across the Jordan spread rapidly among the Canaanites, and when they heard what God had done, they were very much afraid. We are told that "their heart melted, neither was there spirit in them any more, because of the children of Israel." 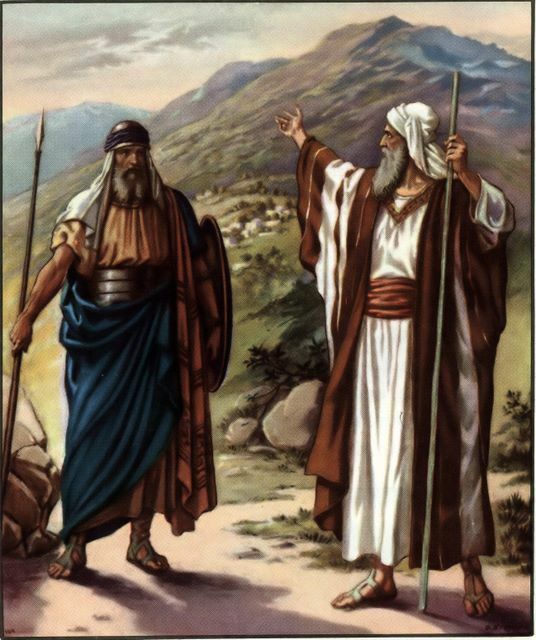 God had said to Joshua that the land of Canaan was to be taken possession of by the Israelites; and had commanded him to "Be strong and of a good courage," and had strengthened him by saying, "Be not afraid, neither be thou dismayed, for the Lord thy God is with thee whithersoever thou goest." Joshua and the people were now in Canaan, and before them lay a stronghold of the Canaanites named Jericho, having high walls and strong gates. This city the Israelites had to capture; but the inhabitants closed the gates and prepared to fight fiercely to prevent Joshua and his warriors from getting in. As Joshua was alone at this time, near Jericho, he looked up and saw a man standing with a drawn sword in his hand. Joshua went to him and asked, "Art thou for us or for our adversaries?" The man answered, "Nay; but as captain of the host of the Lord am I come." Do you know who it was? Was it an angel? I think it was more than an angel. It was the Lord Himself! Joshua fell on his face to the earth and worshipped, saying, "What saith my Lord unto His servant?" Then the Lord told Joshua, as before he had told Moses, to take his shoes from his feet, for the place on which he stood was holy; and instructed him as to how Jericho was to be captured.